Demand for personal armoured vehicles is rising especially in places like Mexico and the Middle East which is why Land Rover has announced its bullet-proof Discovery 4, which is virtually indistinguishable from the standard model and offers the same features. This new Land Rover Discovery 4 Armoured succeeds the old model and provides ballistic protection in accordance with European standards BS EN1522 level FB6 and BS EN 1063 level BR6. The car was developed in conjunction with Centigon – a high-tech security company – and features steel plating and glazing to the extent that the car can withstand an explosion of up to 15kg of TNT within close proximity. There’s blast protection underneath the car as well to allow it to withstand the detonation of two DM51 hand grenades. The protection offered was certified by QinetiQ, a globally recognised independent blast and ballistic testing organisation. Because of the extra weight of the armour plating, the car weighs 3550kg, so has upgrades to suit; The car comes with a Land Rover 5.0-litre, 375PS, V8 engine which will still take the take the car from 0-100kph (62mph) in 10.6 seconds.The Discovery 4 Armoured comes equipped with six-piston front brake calipers clamping Alcon brake discs and four-piston calipers at the back. 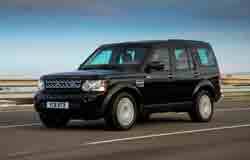 Land Rover says that 'the Armoured will stop just as effectively as the standard Discovery 4'. From the exterior it’s hard to spot the difference, mainly because there is no immediate difference; it all looks pretty much the same. Nonetheless, every bit of protection plating has been blended in with the car’s design and passes all European compliance standards. All Discovery 4 Armoured vehicles have a full three-year, 80,000km factory warranty and you can even opt for a Armoured Vehicle Driver Training program.